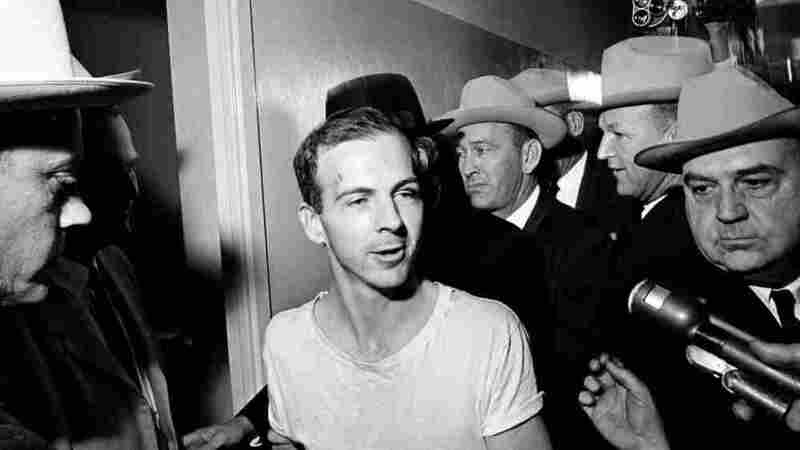 Author Sees Parallel In Giffords Shooting And JFK Assassination : Shots - Health News James Reston Jr. theorizes that Texas Gov. John Connally, rather than President Kennedy, was Lee Harvey Oswald's principal target of assassination in Dallas. Oswald was aggrieved about his dishonorable discharge from the Marines Corps. 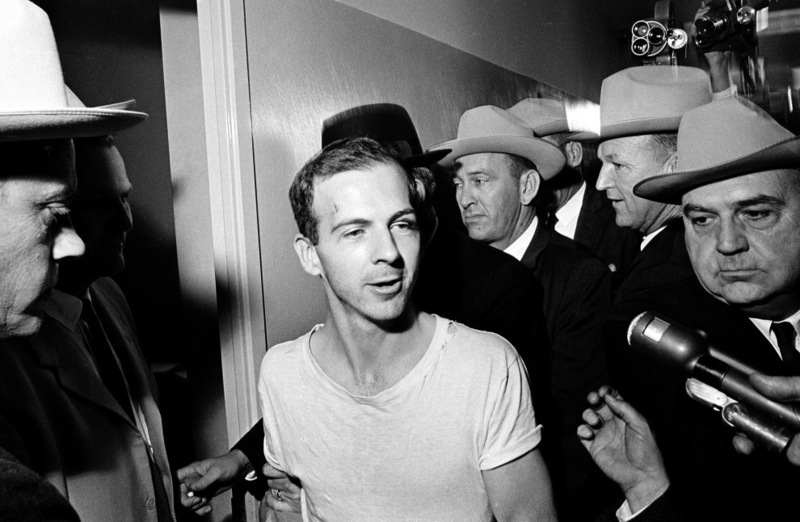 Surrounded by detectives, Lee Harvey Oswald talks to the press as he is led down a corridor of the Dallas police station after the assassination of U.S. President John F. Kennedy. On Friday's Morning Edition, NPR's Alix Spiegel reported on the motives of assassins interviewed for a Secret Service study published in 1999. A longing for fame turned out to be a more important factor than a particular ideological view, the researchers found. "It was very, very rare for the primary motive to be political, though there were a number of attackers who appeared to clothe their motives with some political rhetoric," one of the researchers told her. Today's story led author James Reston Jr. to write Spiegel about his own theory, developed during research for a biography of Texas Gov. John Connally, that Connally, rather than President Kennedy, was Lee Harvey Oswald's real focus. I was fascinated by your report on assassinations this morning for a personal reason. In my 1988 biography of John Connally of Texas [The Lone Star: The Life of John Connally] I had three chapters on the Dallas assassination. There I developed a theory, based upon intensive research in the back volumes of the Warren Commission, that Lee Harvey Oswald's principal target was not Kennedy, but Connally. It would take too much time to lay the theory out in detail here. But essentially, the idea is that Oswald, schleppy little guy that he was, had an intense personal grudge against Connally, because he (Oswald) believed that Connally as Secretary of the Navy (before becoming governor) was complicit in changing his discharge from the Marine Corps from honorable to dishonorable, or at least, not redressing the outrage of that change. Oswald's letters to Connally are deep in the background volumes of the Warren Commission. In those back volumes, Oswald's wife, Marina, testified to the Warren Commission that Connally was her husband's target. I took your report this morning as confirmation of that theory. Oswald had nothing against Kennedy -- indeed, everything suggests that he and his wife Marina admired the president and the first lady. Like Loughner, Oswald had experienced failure after failure -- he was a wretched little man -- but the one thing he'd accomplished was a successful tour in the Marine Corps, and Connally, his fellow native of Fort Worth, had allowed that accomplishment to be undermined, summarily, with no hearing and no attempt to contact Oswald. It's always interested me that the Warren Commission ultimately argued that Oswald's motive was grand and epic: to decapitate the U.S. government. But little people, with 9th grade educations, rarely have such cerebral thoughts.The Commission felt, I think, that it had to have a motive that was as grand as the crime itself. If my theory is right, President Kennedy was an accidental victim in Dallas.